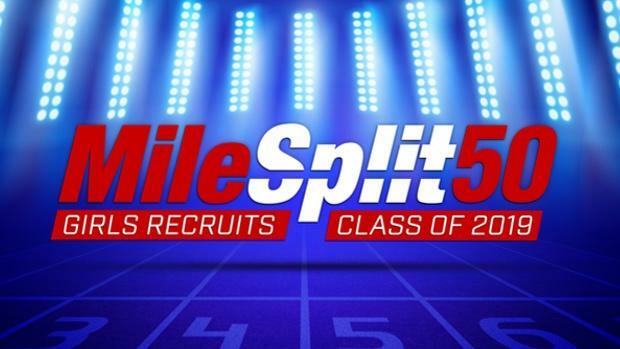 MileSplit has made a subjective ranking of the top 50 girls recruits in the Class of 2019 ahead of the National Letter of Intent signing period, which begins November 14 and runs through August 1. We ranked our top 50 athletes based on a tiered rating system, current MileSplit50 track and field and cross country rankings, state records, historical results and performances over national competition. Saratoga Springs (NY) Distance North Carolina State A prolific distance runner who's posted three top 5 performances at NXN and won an international title with Team USA's juniors in a cross country challenge in Scotland. She's run indoor times of 3:28.30 for 1K, 4:25.45 for 1500m, 4:44.55 for 1-mile, 9:21.11 for 3K and 10:02.36 for 2-miles. Outdoors, she's posted bests of 4:23.81 for 1500m and 9:18.09 for 3K and 9:59.62 for 3200m. Walton (GA) Hurdles/Jumps University of Oregon A World U20 champion, Pan-American Junior champion and multiple New Balance National Outdoor and Georgia champion in the 100mH, as well as the national record holder, Jones could be a future Team USA senior team member. She's run three efforts under 13 seconds all-time and also owns PRs of 12.07/23.96 and 19-0 in the 100/200/LJ. White Lake Lakeland (MI) Hurdles/Sprints University of Florida Recent Youth Olympics champion in the 100mH at 30' hurdles in 12.83 (+3.7) seconds (a record) and a 2-time Michigan state champion and 1-time NBNO champion, she owns a WL PR of 13.16 in the 100mH and 11.47/24.99 in the 100/200. Mills Godwin (VA) Sprints University of Tennessee A superb indoor or outdoor performer, she's a 6-time state champion across indoor and outdoor competition. Her ridiculous range includes 100-200-300H-400-400H-500. She owns a class record for 400m outdoors and sports outdoor 200/400 PRs of 24.13/53.63. Her performances in the 300/400/500 indoors rank on the top 50 efforts all-time. Malibu (CA) Distance Dartmouth College A 2-time Foot Locker Nationals and 2-time CIF XC winner who's broken numerous course records, she's produced XC bests of 14:30 for 4K, 15:49.00 for 3-miles and 16:30.30 for 5K. Outdoors, she owns CIF state title in the 3200m from 2017 and has posted bests of 2:17.30/4:51.27/9:57.52 for the 800/1600/3200. Rockford (MI) Distance University of Michigan One of the nation's best over the past two seasons in XC, she's a 1-time Foot Locker Nationals qualifier and 2-time Michigan state XC winner who's posted a 5K PR of 16:43.30. But she's also posted bests of 2:19.07/4:45.17/10:05.01 in the 800/1600/3200. Her best outdoor performance may have been her 9:59.92 in the 2-mile at Brooks PR. Spencerport (NY) Mid-Distance University of Tennessee She's a 2-time state champion across indoor and outdoor competition and owns PRs of 54.58/57.77/2:15.08 in the 400/400H/800. She's also split 1:12.83 in the 500m indoors and 1:30.09 in the 600m. Her performances in the 500/600 rank among the top 50 performances all-time indoors. Western Branch (VA) Sprints/Hurdles University of Kentucky A 4-time state champion across indoor and outdoor competition, she owns PRs of 11.65/13.40/23.90/44.22 in the 100/100H/200/300H. She's also split 56.84 in the open 400 and has run 6.97 in the 55m and 8.35 in the 60mH indoors. Minneapolis Washburn (MN) Distance University of Colorado A 2-way distance recruit who's a 3-time state champion across cross country and track and field, Covert has produced a 4K best of 14:15.00 and a 5K best of 16:55.71. She ran 4:44.55 in the 1500m and 10:06.19 in the 3200m outdoors. Wausau West (WI) Hurdles University of Texas Arguably the nation's top long hurdler in the Class of 2019, Jaworski came on extremely strong to end her junior year, qualifying for the U20 Championships in the 400mH. She's a 6-time state champion in Wisconsin who's produced a 300mH best of 41.40 and 400mH effort of 57.57. She's also proficient int he 100 (12.15) and 200 (24.26) and elite-level in the 400m (53.44). Ursuline School (NY) Mid-Distance Stanford University A nationally elite mid-distance runner, she owns outdoor PRs of 2:09.74 in the 800m, 4:27.80 in the 1500m and 10:05.80 in the 3K. Indoors, she's ranked within the top 50 all-time in the 600m (1:34.59) and 1K (2:45.83) and has posted a 1500m best of 4:29.30. Portsmouth (RI) Distance Villanova University One of the Northeast's top mid-distance recruits, with PRs of 2:07.2 in the 800m, 4:29.70 in the 1500m and 10:02.41 in the 3K. Merrill is ranked among the top 50 all-time in the 600m (1:31.79) and 1K (2:49.43). Nansemond River (VA) Sprints/Hurdles Clemson University A 4-time outdoor state champion in Virginia and possesses a wide range of talent in the short and long hurdles and in the sprints. Sports PRs of 13.49/24.36 in the 100mH/200 and 41.28/61.17 in the 300mH/40m0H. Brebeuf Jesuit Prep (IN) Sprints University of North Carolina Indiana's 100m champ from 2018, she owns outdoor PRs of 11.55/23.73 in the 100m and 200m. She also has posted a best of 7.41 in the 60m indoors. Buford (GA) Sprints Stanford University A proficient sprinter indoors and outdoors, she's a 2-time national champion and a 3-time outdoor champion in Georgia with PRs of 11.63/23.43. She's also split 43.67 for 300m and 1:53.28 for 600m. She's posted times of 7.59 in the 60m indoors and 24.30 for 200m. Perkiomen Valley (PA) Jumps/Hurdles Arizona State University A 3-time champion in Pennsylvania, she's one of the top jumpers in the country and an elite hurdler. She owns a WL TJ PR of 41-1.5 and an 100mH best of 13.71. She's also LJ'ed 18-10.25 and has produced marks of 18-9/40-10.75 in both jumps indoors. Natick (MA) Distance Stanford University A 4-time champion in Massachusetts over XC and track, she sports indoor PRs of 2:55.19 in the 1K, 4:33.44 in the 1500m, 4:51.28 in the mile and 10:10.42 in the 3K. Outdoors, she's gone 2:13.41 in the 800m, 4:49.34 for 1-mile and 10:41.79 for 2-miles. Mounds View (MN) Pole Vault University of Georgia The bar keeps going up for Fixsen, a 2-time Minnesota state champion who qualified for the World U20 Championships after a 13-11.25 vault. She cleared 13 feet eight times across 2018 and was over 13-9 two other times. She's also a proficient high jumper (5-7). Noblesville (IN) High Jump University of Georgia Arguably the nation's top high jumper for the Class of 2019. The 2-time Indiana champ netted a US No. 2 leap of 6-0.75 to win the USA Junior Championships, qualifying for the World U20 Championships. She's cleared 6-feet a total of three times and has lifted higher than 5-10 a total of six times all together. Western Branch (VA) Sprints/Hurdles University of Kentucky A tremendously versatie athlete in both indoor and outdoor track and field, she's produced PRs of 12.03/14.22 in the 100m and 100mH, 42.26/58.67 for 300mH/400mH and 54.94 for 400m. She's also split 2:12.96 for 800m. Indoor, she's posted times of 39.49 for 300m, 1:13.22 for 500m. Gates-Chili (NY) Pole Vault Penn State University In a particular strong year for pole vaulters, Ellis could be the best among them. She posted a vault of 14-1.25 indoors in Akron, though had to compete unattached and didn't follow outdoors. In her outdoor sophomore season she cleared 13 feet a total of four times across indoor and outdoor competition. Cypress Ranch (TX) Sprints Considering: Texas, Baylor, LSU, Texas Tech, Arizona State, UCLA May be Texas' top returning sprinter, she posted a wind-legal best of 11.32 in the 100m, 23.49 in the 200m and has also long-jumped a quality mark of 19-1. She also has posted a 400m best of 58.77. Tahoma Senior (WA) Sprints University of Kentucky The 2018 Brooks PR winner in the 100m and a 3-time champion in Washington, she's posted top times of 11.49 in the 100m, 24.24 in the 200m and 6.96 in the 55m. Kennedale (TX) Sprints/Jumps University of Florida The top sprinters in Texas are incredibly talented, and Brown will be in the hunt for state hardware. She has posted PRs of 11.50 in the 100m and 24.08 in the 200m and has long jumped an elite mark of 20-0.5. Indoors, she's run 6.85 for 55m and 24.37 for 200m. Lake Stevens (WA) Distance Oklahoma State A rangy mid-distance runner, Roe has gone 2:09.98 for 800m, 4:29.72 for 1500m and 9:54.47 for 3K. In XC, she's also posted a 5K best of 17:21.60. Fowler (CA) Throws Auburn University Arguably the top thrower in The Class of 2019, she's posted a top discus of 174-2 and shot put of 47-7. Her discus effort ranks her within the top 50 marks all-time in the event outdoors. Duncanville (TX) Sprints Arizona State University Among the elite sprint recruits in Texas, she owns PRs of 23.96 in the 200m and 53.80 in the 400m. She's also proficient in the 800m, with a top time of 2:17.28.